I haven't done a Frivolous Friday post in quite awhile, because it honestly just feels like "filler" unless it's something I'm really excited about. 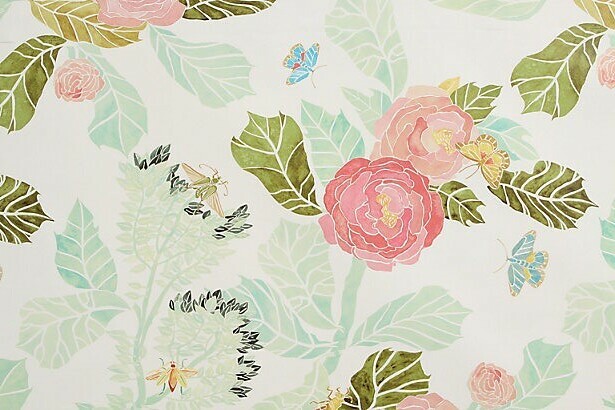 And this wallpaper from Anthropologie? It's got me excited. I can't stop thinking about it. Even though there are butterflies on it, and I'm kind of afraid of butterflies (mostly it's moths, but really big butterflies are freaky too). But back to the wallpaper. It's so unbelievably pretty, but I'd never have the guts to actually spend the money and put it up anywhere. I think I'd get sick of it far too quickly, and it's probably a little frilly for Mike's taste anyway. I wish I could just buy a swatch instead of a whole roll. That would be ideal.